“MGM is committed to celebrating diversity and the beauty of other cultures. We’re excited to bring ‘KABUKI LION’ to Las Vegas so that audiences from around the world can experience the tradition that Japan has kept alive for centuries,” said Bill Hornbuckle, president of MGM Resorts International. Originating in the early 17th century, Kabuki combines three Japanese words, “ka” - signifying song, “bu” - dance and “ki” - skill. The art form is known for its stunning presentation, dynamic fight scenes, masterful choreography and the unique “onnagata” - male actors who impersonate women in Kabuki theatre. “KABUKI LION Shi-Shi-O: The Adventures of the Mythical Lion” will perform in Las Vegas during Japan’s Golden Week, which commemorates several national holidays including Shōwa Day, Constitution Memorial Day, Greenery Day, and Children’s Day. Due to the holidays, Golden Week is one of the busiest times of the year for Japanese nationals to travel. To celebrate Golden Week, dynamically designed hologram samurai shows will return to The Fountains of Bellagio from April 29-May 7. The water shows can be seen daily at 8 p.m., 9 p.m., 10 p.m., and 11 p.m. The coming-of-age tale tells the story of Shi-Shi-O, a devout Buddhist who sends his children on a mission to defeat a mythical creature and retrieve a sacred sword that has been stolen from Monju, the deity of spiritual wisdom. To do so, the brothers must descend from a stone bridge and into the netherworld, where they face trials and tribulations that also serve as rites of passage. In August 2015, Shochiku, the world’s premier Kabuki producer and global ambassador, debuted another epic performance also starring Ichikawa Somegoro. The limited-run production consisted of a series of shows staged at The Fountains of Bellagio, integrating the ancient art form with water choreography, projections and music to create a visually stunning spectacle. 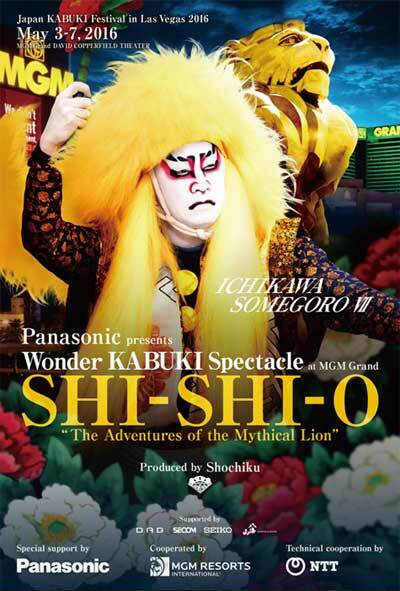 The variety of ventures produced by the company, including “KABUKI LION Shi-Shi-O: The Adventures of the Mythical Lion,” all aim to raise worldwide awareness for the art by orchestrating elaborate, high-tech performances unlike anything Las Vegas and traditional Kabuki have ever seen. “KABUKI LION Shi-Shi-O: The Adventures of the Mythical Lion” brings together Panasonic and the Nippon Telegraph and Telephone Corporation to create a high-tech, full-feature production inside the David Copperfield Theater. “KABUKI LION Shi-Shi-O: The Adventures of the Mythical Lion” will perform Tuesday, May 3 through Friday, May 6 at 8 p.m., and Saturday, May 7 at 7 p.m. and 10 p.m. To purchase tickets, visit mgmgrand.com or call 1-877-880-0880.